PEACE IN TIME BOOK BLITZ! M.C.V. Egan, author of The Bridge of Deaths, promotes world peace in a unique way. Welcome to 4writersandreaders, M.C.V. Egan. Thank you, Bette, for inviting me today for an interview and for participating in the acknowledgement of the United Nations 33rd International Peace Day. It’s both a pleasure and a privilege to have you with us today, Catalina, as people around the globe recognize September 21st as The International Day of Peace. Your novel, The Bridge of Deaths, promotes world peace in a unique way. I’m sure we’ll find out more about that from you today. Tell us a little about yourself, Catalina. I was born in Mexico City, Mexico 54 years ago. Through the twists, turns and opportunities in life, I have lived in Mexico, France, Sweden and various parts of the USA. Consequently I have managed to acquire four languages and a variety of cultural influences. I now live in South Florida with my husband and teenage son. How about your family and community life? I am a mother and a wife. I am also a step mother and a step grandmother. I live in an area where the sense of community is very mixed as the brunt of the population only lives here for part of the year; they are known as snow-birds and flock from various northern parts of the USA, Canada and Europe. This has enriched our area in so many ways. Exposure to cultural diversity and great restaurants are only a small part. I have been writing since I was a young child. My writing varies with the exception that I have never dipped into Horror, Sci-Fi or Fantasy, I dabble and test just about any other genre. Can you give us a brief synopsis of your novel? It is a well-documented historical journey with a touch of fiction and a metaphysical twist. The story revolves around the 1939 crash of airliner G-AESY and it is explored from the perspective of a modern-day couple researching their past lives. In general what prompted me to write was an innate need to communicate. It is not that easy to be heard when you are one of eight kids in a family of very loud voices. Do you have a favorite line or brief selection to share from The Bridge of Deaths? I do have one, but it would make no matter of sense at all to anyone who has not read the book. Maggie is my favorite character for a number of reasons. She is the only primary character who is absolutely fictional, and that granted an amazing freedom to me as a writer. I could make her as fearless and lovely as I chose. Also, I made her a young woman of great convictions, especially in regards to striving for WORLD PEACE. In the case of The Bridge of Deaths, acquiring the information―research was the hardest part. I am trying to devote myself to writing and parenting these days. I have worked in the past and I enjoy it. I feel at this stage in my son’s life it is very important to be a very hands-on parent. How can readers get a copy of The Bridge of Deaths? What’s next for you, M.C.V. Egan? I am writing, working on a series in more of a Chick Lit genre. Also, through a local writers group, I am dabbling in short stories and one-act plays. Next year when new files pertinent to the crash of the G-AESY ―because of the 75-year disclosure rule in Europe―I do hope to uncover much more or all of the facts surrounding the crash. But the next four years in parenting will be pivotal, so my projects may well go slowly. Thank you, M.C.V. 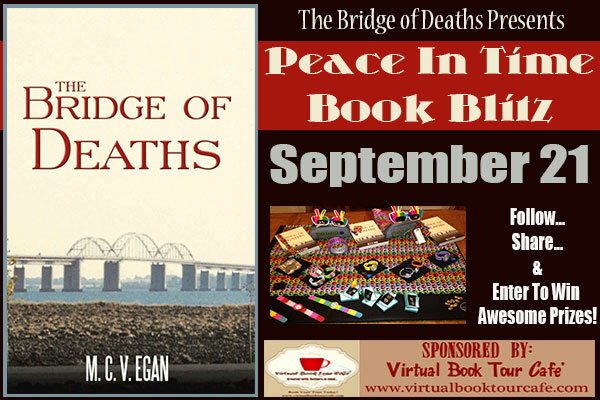 Egan, for including 4writersandreaders in your PEACE IN TIME Book Blitz & Blog Hop presented by The Bridge of Deaths and VBT Cafe. It’s been wonderful having you featured here on September 21st ― United Nations 33rd International Peace Day―a day designated to promote world peace. Readers, come join the Blitz―enter the contest to win some fantastic prizes; then, stop back to visit the great blogs promoting world peace with M.C.V. Egan. And, don’t forget to get your copy of The Bridge of Deaths, if you haven’t already had a chance to read it. Find out how Maggie shares M.C.V. Egan’s message of Word Peace. I highly recommend this novel to readers around the globe. Readers can get my personal perspective on world peace in my article Let’s Paint the World with Peace. http://4writersandreaders.com/2013/09/19/lets-paint-the-world-with-peace/ ~ I invite you to stop by to read my post and leave me your perspective on how we can attain world peace. I would love to hear what you think about World Peace. DON’T FORGET TO ENTER THE GIVEAWAY (simply click the link below) RIGHT HERE! To me, “Peace in Time” means that it will take time and effort to make World Peace a reality… It is an ongoing process that starts within each one of us. What a lovely interview. I’m reading The Bridge of Deaths now and like the passage that was mentioned. Thanks, Toi. I’m now following your blog. The new cover for your book is awesome!